Lee & Low Books, New York, 2013. 32 pages. Recently, Betsy Bird of School Library Journal’s Fuse 8 blog did a post about “casual diversity” – books that include characters from diverse backgrounds, but where that isn’t the point of the story. Race or disability isn’t seen as a problem, it’s just the way the world is. Shortly after reading that post, I read King for a Day and was delighted to find such a wonderful example. The story is about Basant, a kite festival that happens every year in Lahore, Pakistan, to celebrate the arrival of Spring. 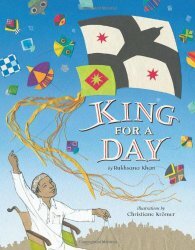 We focus on a boy, Malik, who has been planning for a long time to win the kite battles, to be king of Basant. He has one kite which he has crafted himself. He flies his kite from the roof of his building. Right away, he comes up against a bully who lives nearby, who has a big, expensive kite. But Malik is triumphant. And the day continues, battling all kinds of colorful kites. The illustrator has beautifully created many different cloth kites for these pages. Big kites, little kites, fancy and plain. Even kites made of old newspapers. Sometimes I catch them in groups. Making wide circles around clusters of kites, Falcon slashes through their strings. For a while the kites fly where the wind carries them. When they land, they’ll belong to whoever finds them. But at least they will have tasted freedom. Insha Allah, I really am king of Basant today! So we have a wonderful story about a kid living in another culture tasting victory. But what takes this a step further is that Malik is in a wheelchair. It’s never mentioned in the text, that is just the way Malik is. His sister helps him with the kite’s taking off and helps him gather the kites that come to their rooftop. His brother, down below, gathers kites that drift downward. They help Malik with things that need feet, but he is the mastermind and the chief kite battler. The illustrations are beautifully done in collage, with a wonderful variety of kites, in particular. Simply a marvelous book. This entry was posted on Sunday, May 25th, 2014 at 7:11 pm and is filed under Contemporary, Cross Cultural, Picture Book Review, Starred Review. You can follow any responses to this entry through the RSS 2.0 feed. You can leave a response, or trackback from your own site.